"The maltiness of dark beer really does amazing things for this gravy. It's a very simple dish, but at the same time it has a deep, complex, rich flavor. I served this in a nice ring of green onion-mashed potatoes. I hope you give this a try, whether for St. Patrick's Day or anytime of the year." Cook and stir bacon in a heavy skillet over medium-high heat until bacon is browned and crisp, 3 to 4 minutes. Turn off heat and transfer bacon into a large stew pot, reserving bacon fat in the skillet. Season beef chuck cubes generously with 1 teaspoon salt and black pepper to taste. Turn heat to high under skillet and sear beef pieces in the hot fat on both sides until browned, about 5 minutes. Place beef in stew pot with bacon, leaving fat in skillet. Turn heat down to medium; cook and stir onions in the retained fat in the skillet until lightly browned, 5 to 8 minutes; season with a large pinch of salt. Cook garlic with onions until soft, about 1 minute; pour beer into skillet and stir with a wooden spoon, scraping up and dissolving any browned bits of food into the liquid. Pour cooking liquid from skillet into the stew pot. Stir in tomato paste, thyme sprigs, carrots, celery, sugar, 1/2 teaspoon black pepper, and enough chicken broth to cover. Bring stew to a gentle simmer, stirring to combine; reduce heat to low and cover pot. Simmer stew until beef is fork-tender, about 2 hours. Stir stew occasionally and skim fat or foam if desired. 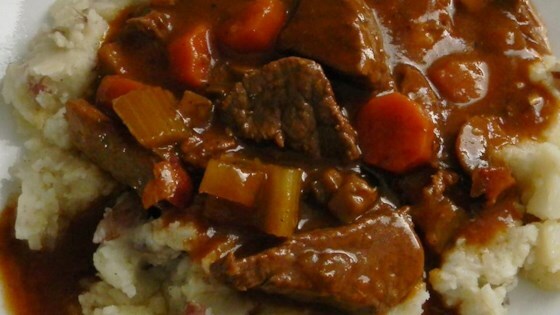 Dark beer does delicious things to traditional beef stew. Thought it was fantastic. Cooked it in my dutch oven. Added turnips to the mix. It was a big hit! !